Normally I don't really give much thought to my hands. They don't really get dry, so I rarely need to use hand cream, but since I found these lovely rings in River Island for just £2 each, I've begun to make a bit more of an effort. The one on the left is a thumb ring, and has tiny cut-out heart detail on it. I usually wouldn't go for this kind of thing, but I find it very comfortable on my thumb, and it makes a very easy to wear accessory. The other two are midi rings, and I have seen them absolutely everywhere recently! They also do some 'crossover' rings, but they only had these in size XS when I went in. I find these very flattering, as my fingers usually tend to look a little stumpy. I wear them both on the same finger, with a tiny gap in between, as I find this gives the best effect. Aaand.. my nail polish collection is growing again! After clearing out a load of old ones recently, I've been able to justify picking up a few new ones. I saw these on offer in Tescos the other day (2 for £4, I believe.. but don't quote me on that!) 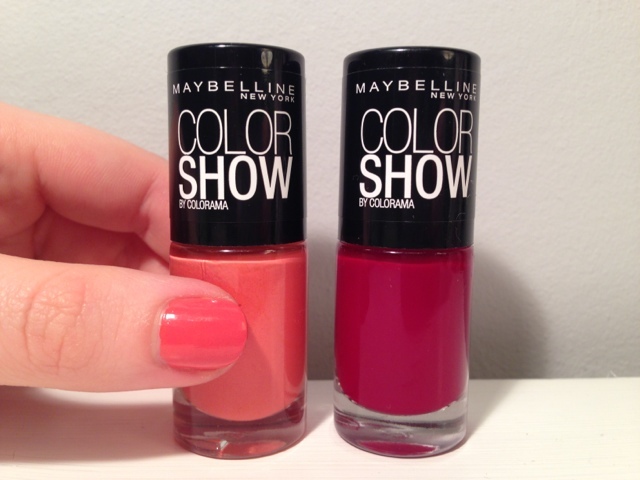 and picked up these two colors - 342 Coral Craze, and 352 Downtown Red. I have the coral on my fingernails at the moment. The red is very similar to Barry M Raspberry, a favourite of mine. 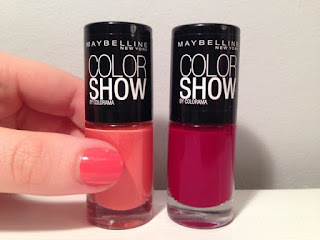 It's a deep red with a very slight pinky tone, and comes out a little darker than shown below. Quality-wise, I can't complain. I've had them on for about 4-5 days now, and there's very minimal chipping, which is surprising as my nail polish usually chips quite a lot after I pick off sticky labels at work. I'm impressed! I may go back and look at some more shades, as I like the brush, and the shape of the bottles. I love love love the rings you got!! 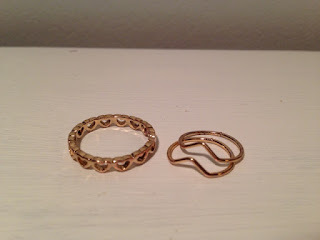 I have been addicted to buying new rings lately...especially thumb rings and midi rings -- and you got both!! So jealous!! They're such a simple addition, but they really make a statement to an outfit. You have such great taste! I wish I could get those exact ones!! Aw thank you! I was so happy when I spotted them in the shop! I've seen a few tutorials on how to make your own midi rings just like these, if River Island is completely sold out, then maybe you could give that a go! Or perhaps look on eBay? I have a really similar ring to the live heart one but its silver and I had it off my auntie years ago!